The online science magazine Nautilus sometimes gives its readers impressions that are completely at odds with reality. Based on many articles Nautilus has had on the multiverse, you might think that this is a well-confirmed scientific concept. But to the contrary, there is not a speck of evidence for any multiverse or any universe beyond or own. There are also very good reasons for thinking that no such evidence could possibly appear, given that any observations that we could possibly make would always be observations of our own universe, not an observation of some other universe. Vent models posit that given the initial conditions, the emergence of life was not a near-miracle. It was inevitable. This statement gives the reader a very wrong idea. Any realistic appraisal of the origin of life must regard it as the most improbable type of event, basically a miracle. To calculate the odds of such a thing, we must consider all of the insanely improbable things that seemed to be required for life to originate from non-life. It seems that to have even the most primitive life originate, you need to have an “information explosion.” Even the most primitive microorganism known to us seems to need a minimum of more than 200,000 base pairs in its DNA (as discussed here). Protein molecules have to be just-right to be functional. It has been calculated that something like 1070 random trials would be needed for a functional protein molecule to appear, and many such protein molecules are needed for life to get started. And so much more is also needed: cells, self-replicating molecules, a genetic code that is an elaborate system of symbolic representations, and also some fantastically improbable luck in regard to homochirality. Postulating hydrothermal vents as the spot where life originated does nothing to help with these problems. 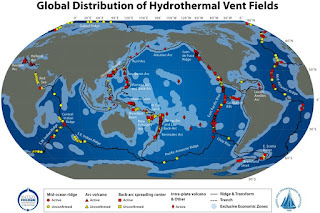 A hydrothermal vent could supply some heat. But a lack of heat was never the issue. The issue was the appearance of life requires a very high degree of organization and functional coherence that should have been fantastically improbable to have occurred by chance. By claiming that life appeared at hydrothermal vents, it seems that you are sharply decreasing the odds of life appearing, not increasing them. As the map below shows, hydrothermal vents are found on only a tiny fraction of the ocean's surface, at the bottom of the ocean. A person assuming that life might have originated anywhere in the ocean would be assuming perhaps 100,000 times more volume of space for chemical reactions to occur. What most goes against our intuition is that complex structures can be better dissipaters of energy than simpler ones. Catalysts help you up an energy hill so that you can drop even further down on the other side. Casting our gaze across the entirety of biological evolution, each organism is such an energy hill. It forms only if it is thermodynamically favored—if by pumping energy uphill to create it, even more energy is released. ...A world that also includes warm-blooded cows, munching grass and emitting heat, methane, and fertilizer, is an even better entropy engine; one with tigers is better still. It is the ecosystem that is energetically favored: A lush green Earth teeming with life pulls more heat out of the hot center of the planet and out of the sun, releasing it into cold, dark space, than does, say, Mars. Our biosphere is but a sophisticated icepack for the sun. A giant dissipation engine came on the scene with Homo sapiens. The history of technology is ultimately one of developing ever more powerful methods of extracting energy from the earth and sun: fire, cooking, agriculture, mining, smelting, logging, steam engines. Like a trickle of water flowing downhill, the exact path of neither evolution nor culture is predetermined—only the overall trend. Thus, neither art, nor war, nor NASCAR, nor smart phones were inevitable, but all can be seen as work done by the human entropy engine. In this light, our dissipative tendencies are not an aberration, but thermodynamically required. As some type of attempt to explain the origin of life and increasingly complex biology, this thermodynamic twaddle is a complete bust, and we can laugh at the loopy statement, “Our biosphere is but a sophisticated icepack for the sun.” The term dissipation is defined as “squandering of money, energy, and resources.” Such a concept does nothing to explain biological organization. If some chemicals become organized into a life form, that is the opposite of dissipation. Far from helping us out in regard to the origin of life, the second law of thermodynamics just gives a reason for thinking that such a thing is all the more unlikely. The second law of thermodynamics says entropy or disorder always increases as times goes on. If we have life appearing and becoming ever more organized, that is a trend that is disfavored (but not prohibited) by the second law of thermodynamics, rather than something favored by it. Far from being thermodynamically favored, each increase in biological order is thermodynamically disfavored. Similarly, each step you take up a stairs is disfavored (but not prohibited) by the law of gravity. You can summarize the second law of thermodynamics like this: it likes anything that involves a dissipation or dispersion of heat, but doesn't like anything that involves a concentration of heat. Because life forms are a concentration of heat, they are thermodynamically disfavored. Things that are thermodynamically favored are things like a fire burning out, a hot object cooling down, and the sun eventually burning out. Deep ocean hydrothermal vents are the systems most likely to have given rise to life. These far from equilibrium systems do at least favour the production of organic molecules, the biomass that makes up cells, but the level of self-organisation and dynamism required to get from cell matter to living cells is so great that we're in no position to specify the probability of life arising even in the most favourable environment. Comfort seems to favor the “easy life” hypothesis, which claims that the origin of life was for some reason inevitable or all-but-inevitable. There are many reasons for thinking that such an idea is not correct. The main reasons are all of the difficulties in explaining the giant leap in complexity, information and organization involved in moving from non-life to even the simplest living thing. Another reason for rejecting the “easy life” hypothesis is that despite more than 65 years of laboratory research, no one has been able to artificially create life in a laboratory. If it were true that the origin of life was thermodynamically favored, then it wouldn't be too hard to create an origin-of-life experiment which produced life from non-life. Still another reason for rejecting the “easy life” hypothesis is the failure of SETI (the Search for Extraterrestrial Life). If the origin of life was somehow thermodynamically favored or all-but-inevitable, then the whole galaxy would be teeming with life, and odds might have favored searching for radio signals from extraterrestrial civilizations. But after decades of effort checking many thousands of sun-like stars, no such signals have been found. Still another reason for rejecting the “easy life” hypothesis is that such an idea implies that life would have originated on Earth many times. If it was “all but inevitable” that life would originate, there should have been many separate origins of life. But the total number of times in which life has naturally originated on our planet seems to be no greater than 1. All earthly life uses the same genetic code. We see no organisms using a different genetic code. But imagine if life had independently originated multiple times on Earth. Then we would see various types of life that each used a different genetic code. In this case would the organisms of Biosphere 1 just destroy the organisms of Biosphere 2 through predation? No, since they both would use a separate genetic code, they would be incompatible. The organisms of Biosphere 1 would not be able to consume the organisms of Biosphere 2 – or, if an organism of Biosphere 1 ate an organism of Biosphere 2, it would not find it nutritious, because it would be using an alternate chemistry. So rather than Biosphere 2 disappearing because Biosphere 1 had a head start, the two biospheres would both exist. There is no evidence of a second biosphere, and life seems to have not naturally originated on our planet more than once. Such a thing argues strongly against the "easy life" claim that the origin of life was inevitable or almost inevitable. Postscript: It is inaccurate for Comfort to be claiming that certain models posit that the origin of life was inevitable. While some of the authors of the papers that he references may have made optimistic statements about the origin of life, neither a mathematical model nor any set of equations could ever show the origin of life was likely. There is no way to put "life" or "a living cell" on the right side of an equation. You could in theory have an experiment or a computer simulation that might show a likely origin of life, but none of the papers that he references involves such a thing. "The law of the wind is a kind of law of dispersion. Wind likes to scatter things far apart. So the wind would bring various things together to make bombs. Because those bombs would be really good at dispersion, at scattering things far apart." This reasoning is fallacious. The "law of dispersion" followed by the wind is not precognitive or intelligent. Such a law is too dumb and short-sighted to first bring things together because this will later eventually serve some goal of causing a high degree of blowing things apart. Similarly, the second law of thermodynamics will act in a way that is completely short-sighted and lacking in any foresight, intelligence or precognition. It makes no sense to postulate that such a law will create things of concentrated heat and low entropy (living things) because such things might eventually engage in dissipation effects that result in heat dissipation and higher entropy. Life forms are a concentration of heat, and there is no concentration of heat that is favored by the second law of thermodynamics. "Easy life" theorists sometimes cite the work of Jeremy England, an MIT Professor. A Harvard professor says, "Jeremy’s work represents potentially interesting exercises in non-equilibrium statistical mechanics of simple abstract systems," but says that any claims it is has to do with biology or the origin of life is "pure and shameless speculation." After quite a few absurdly immodest articles have appeared about his work, England seems to have got more modest. "I would not say I have done anything to investigate the 'origin of life' per se," he now says. He says, "If, when you say 'life,' you mean stuff that is as stunningly impressive as a bacterium or anything else with polymerases and DNA, my work doesn't yet tell us anything about how easy or difficult it is to make something that complex, so I shouldn't speculate about what we'd be likely to find elsewhere than Earth."